We had a great Halloween! I hope everyone else did too! 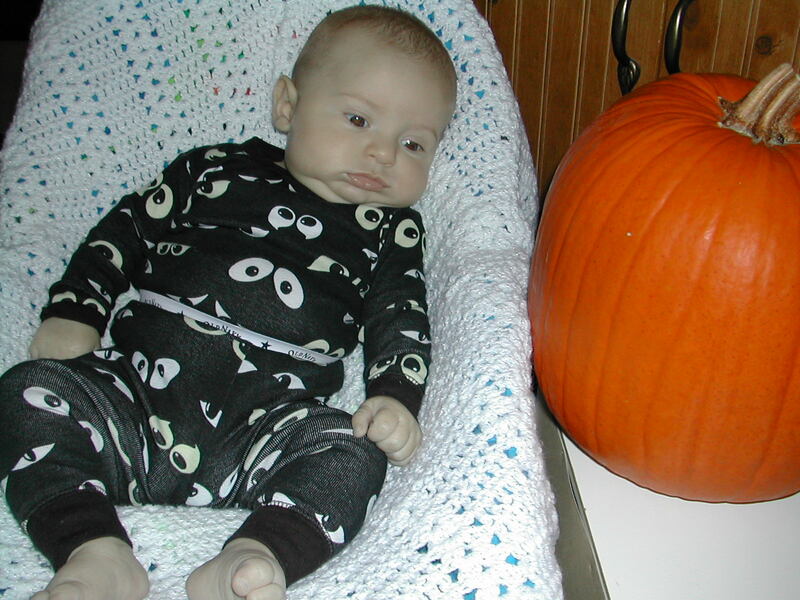 I have made a page with pictures from Halloween.......click here to see those pictures. I have to say he looked absolutely adorable! More details on Halloween on that webpage. It's official, Wednesday is my first day (actually night) back to work. I'm sort of looking forward to going back and getting back in the swing of things, but then again, I can't believe I'll be gone from Hayden that much. The good thing is, at least it's at night when he is sleeping, so I won't feel like I'm missing out on a lot of stuff. The great thing is, he'll probably just be waking up when I get home and he's always so smiley in the morning!........it'll be nice to come home to that. Another great thing is, we won't have to do daycare!......I think I'd have a really hard time leaving him with someone other than family right now, I'm very (overly) protective. His voice or 'words' are changing somewhat this week. He's starting to get more of a squeal or change in the pitch of his voice.......it's so funny! He's almost laughing too! His favorite thing to do is have us sing and do the motions of "Head, Shoulders, Knees and Toes".........it always brings a smile to his face! It was also really neat, one time when he was acting kind of grumpy, I started to fake laugh to see what he would do.....he'd look at me real strange and almost crack a smile, well, I'd keep fake laughing, he'd almost smile a little bit more. Well eventually I was fake laughing so much it made me laugh for real.......and he starts smiling and smiling, then I started laughing even more and he's was just grinning from ear to ear. It was really neat to see the interaction and his response. He's growing and developing so much! He's also real interested in his Baby Einstein DVD. It's amazing how fascinated kids are by that! As he gets older I know he'll really enjoy it.........but it's unreal how much he pays attention to it. As for his weight, I stepped on the scale with him and it read that he was 15.5 pounds.......I'm thinking it might be off about a half a pound or so. He's really growing........he's into 3-6 month clothes and he's going to outgrow the length I think in those pretty early! I've got a cute picture of his chunky thigh on our Favorite Picture website, click here to see that picture and some of the new ones I posted. 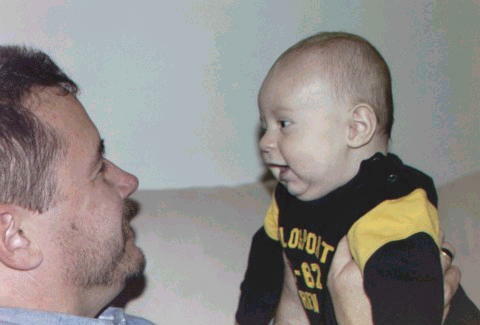 I also found a couple more baby pictures of me and Dennis, who do you think he looks like? Hello everyone! Well, we're all alive still with me going back to work......and I made it through the night without crying! I knew Hayden was in good hands with his Daddy and the two survived without me just fine. I've also been doing ok with getting my sleep during the day (since I work straight nights).......so far Hayden has cooperated and has been taking good naps with mom during the day. 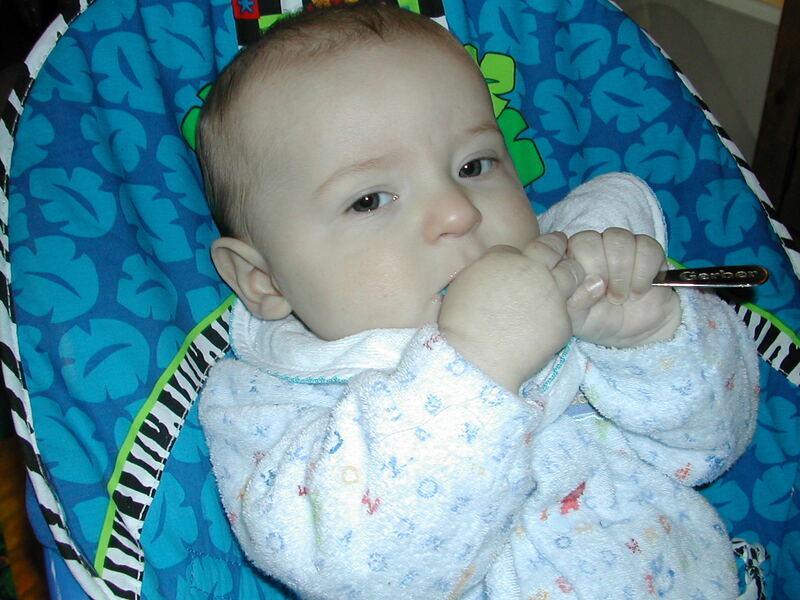 For a while there I thought maybe his teething had gotten better, he wasn't complaining as much or sucking on his fingers as much either. But, this morning he woke up screaming and drooling away, so.......they're back! :-)~.......still nothing poking through but a little tiny white thing (tooth maybe?) on his bottom gums. He's still just talking up a storm........it's like he will start to talk, realize he's doing it and then get louder and higher pitched :-)! It's so funny..........it really can make you laugh. He starting to not enjoy being held as much and really likes his playtime. He still 'goes to the gym' a couple times a day and likes his Hop'n'Pop and his swing. 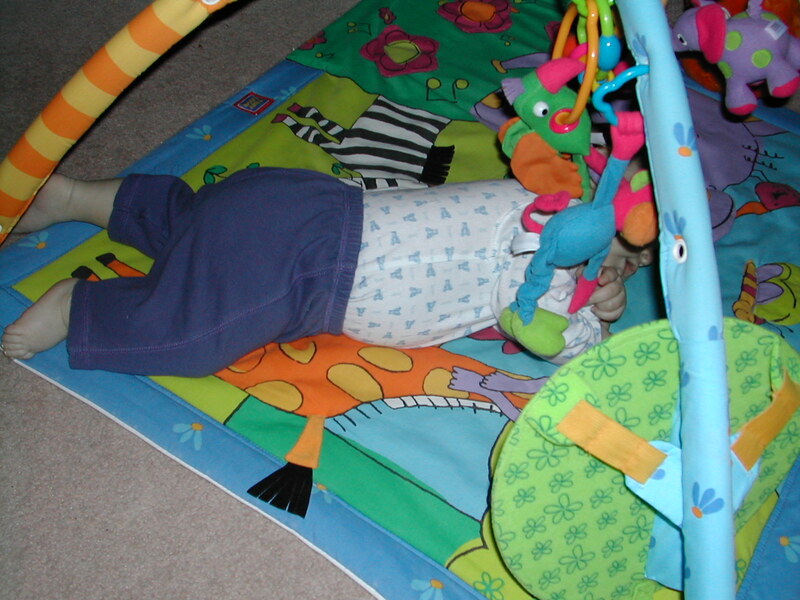 Although, last night he pulled himself up to a more upright position while he was in the swing.........I have a picture below of him doing it.......it was the oddest thing. And then he didn't want to lay flat at all, he'd keep pulling his head and shoulders up, he's got some strong abdominal muscles! He has also discovered his toes.........there's a picture of him looking at them, like he wants to put them in his mouth. I don't have much time for an update today we have to get ready for ANOTHER baby shower for Hayden! 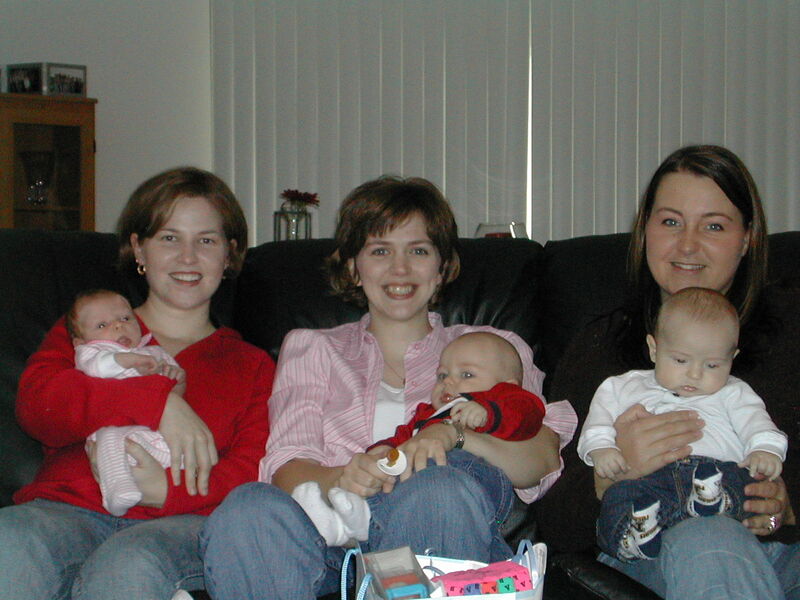 We're having a work shower for me and a couple co-workers who also had babiesat Amy Hendrickson's house. So, we need to get Hayden in the tub and smelling all good for all the ladies! More next week! 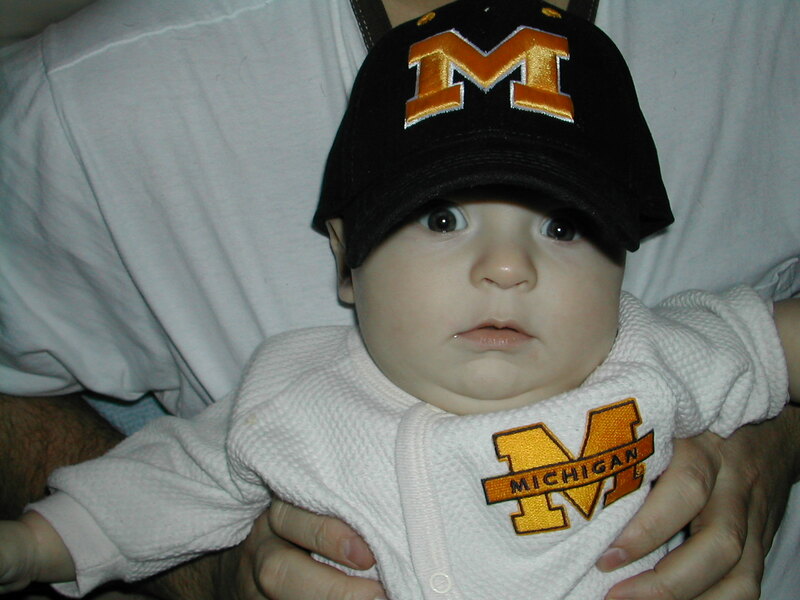 This is from last week, but was so cute, I had to post it......Michigan had an off week, so no new outfit this past weekend! I've also been very busy with working and teaching, so Hayden and Dennis have been spending a lot of time together. Dennis has been a bit frustrated at times because Hayden seems to be having more 'crabby times' and usually as soon as I leave for work, but they're doing great anyway! Next week, he's getting his first official portraits done at Target. Hopefully if they turn out, we'll be sending them out along with Xmas cards. I can't wait to see how he does. He looks right at the camera at home, so I'm hoping we'll get some cute ones at Target. They always do such cute poses. Grandma Deden got him some (a lot actually) really cute clothes at the Carter's outlet, so we have LOTS of things to pick from! An early, "HAPPY THANKSGIVING" to everyone out there from The Reckwards. I can't believe it's that time of year already. Christmas is just right around the corner and I only have one gift bought. I best get on the ball. I'm also a little bit more excited about getting our tree and decorations out this year. 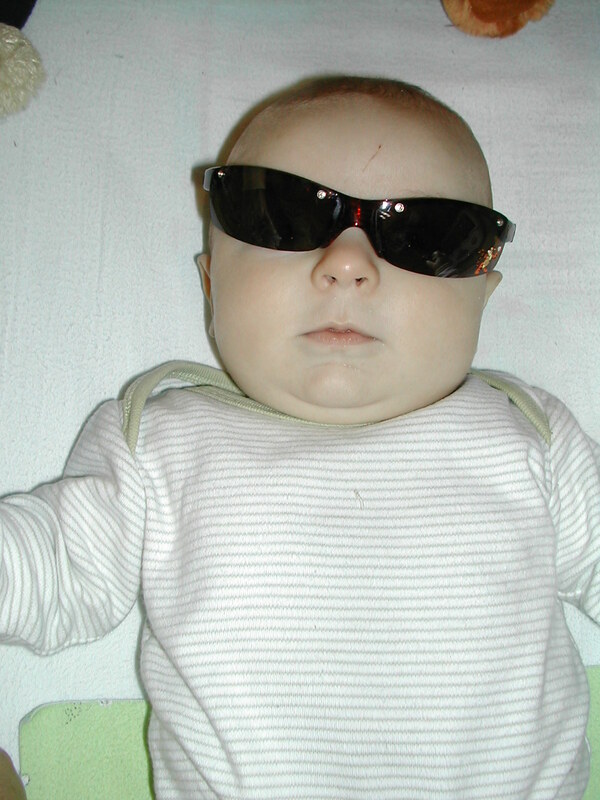 As for the baby, Hayden made is first unscheduled visit to the doctor on Saturday.........and unfortunately it won't be the last. The good news is, it was a wasted trip to the doctor, he didn't have anything wrong with him. He developed late in the week numerous white bumps all over his gums. It didn't look like thrush and it definitely wasn't teeth with how they were clustered all over. One of our transport nurses at work had me look at some pictures and we thought they might be "bohn's nodules" or Epstien pearls(I'll get into more of what that is in just a sec). Well, the nurse practitioner we saw said, it was neither thrush nor 'hand-foot-mouth'..........so then I mentioned this bohn's nodules and he had never heard of it before, so he looked it up on the internet and there was a great picture and he agreed that that is what it was. So, total waste of time and money, but I wanted to be sure. Hayden had been feeling a tad feverish off and on, drooling, cranky......so.....I didn't want him to be sick and us just declaring it 'teething'. 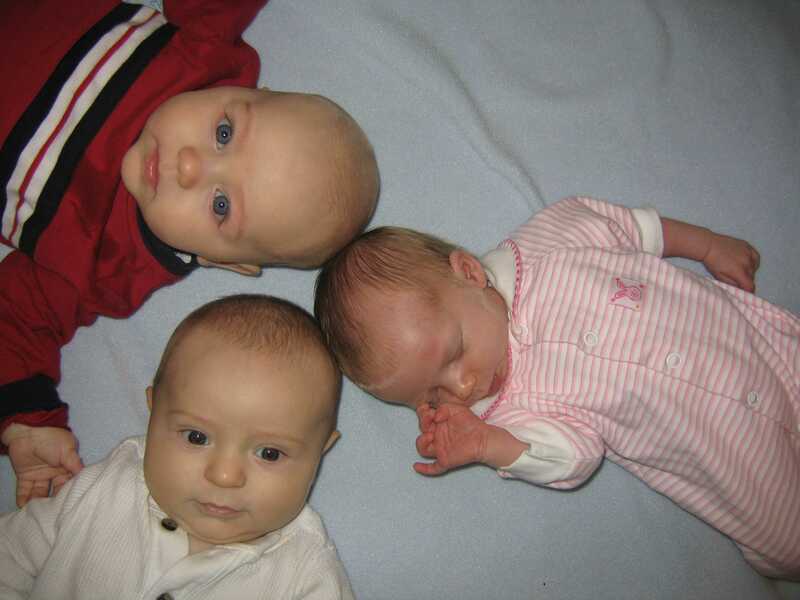 Ok, so Bohn's nodules, I guess occur in 90% of kids......so why haven't any of us heard of it, I wonder? Here is a weblink that describes it, it's nothing really. It looks a lot scarier than necessary! Another fun thing we got to do was go to IKEA for the first time! Hayden slept through the whole experience, but what fun I had. I think I'll be making my way up there quite a bit. It's fan-tab-ulous! My girlfriend Missy (Alex's mom) is celebrating her 30th birthday this week (HAPPY 30TH MELISS!!!! ), so Jenny, Hayden and I went up to visit. 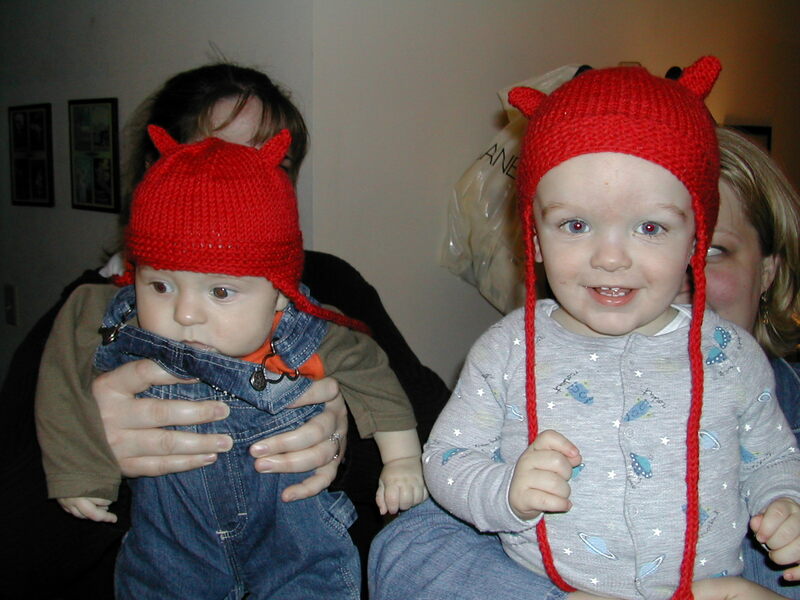 Missy made Hayden the cutest little devil knit cap...........see picture below. Her little boy has his on too, our little devils! Not much went on this week, but we're busy getting ready for Thanksgiving which we're having at our house. It'll be nice to see Gma and Gpa Jim again, it's been since the wedding! They're going to be surprised with how fast he's growing. He's turning over onto his side now and likes to sit up a lot. 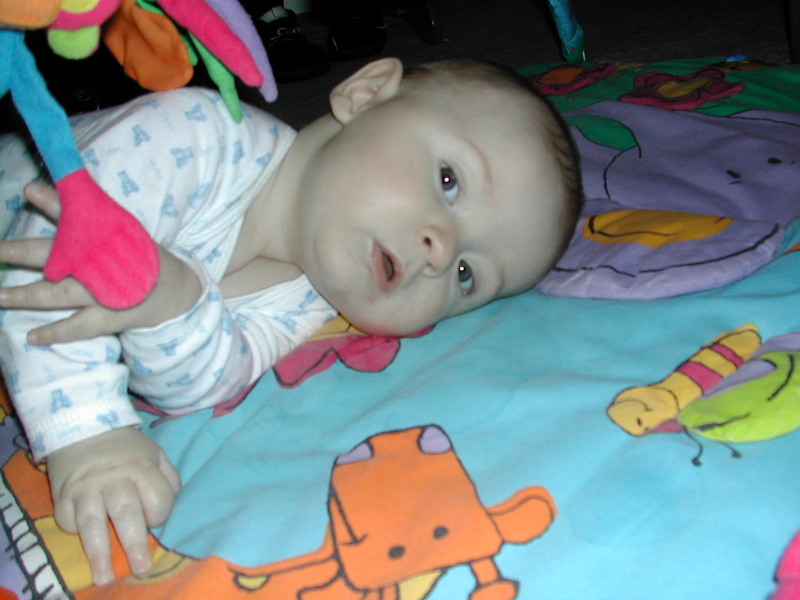 He's also learned how to throw his head back and arch his back when he's mad. 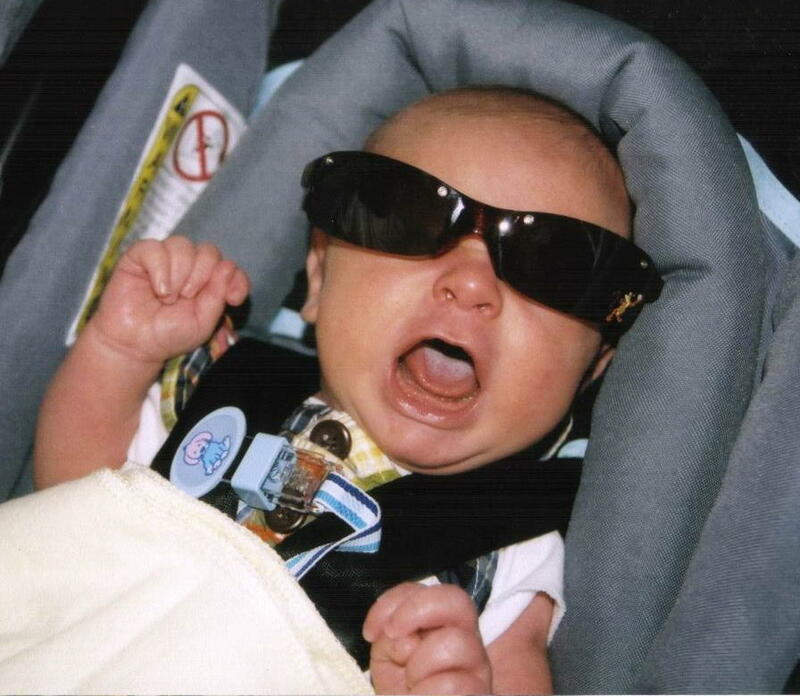 Speaking of growing fast.........I'm posting a picture of Hayden in his sunglasses and an older picture of him in the same glasses, maybe two months apart. How he's grown! I've already had to take clothes and put them in rubbermaids to clear room for his bigger ones. Well, that's all I can think of right now. Life has been fun watching our little guy grow and develop. What a joy he is.........and brings to everyone! What a precious thing! Well, Gma & Gpa Reckward and Uncles Chad & Darin came up to have Thanksgiving with us this year. Gma & Gpa Deden & Auntie Ashley also came over for dinner...........we had a great time.....the food was unbelieveable. Dennis can sure cook! Hayden was happy to have all his family together. Gma & Gpa Jim hadn't seen him in a while, so I was glad they came! He stood in his Hop'n'Pop at the top of the stairs and greeted everyone. I hope everyone had a chance to look at Hayden's pictures at www.target.photoreflect.com username Reckward and passwod 5332. Only one of him in his tuxedo turned out, but it's the best one by far, so I am happy that we have one super duper cute one. 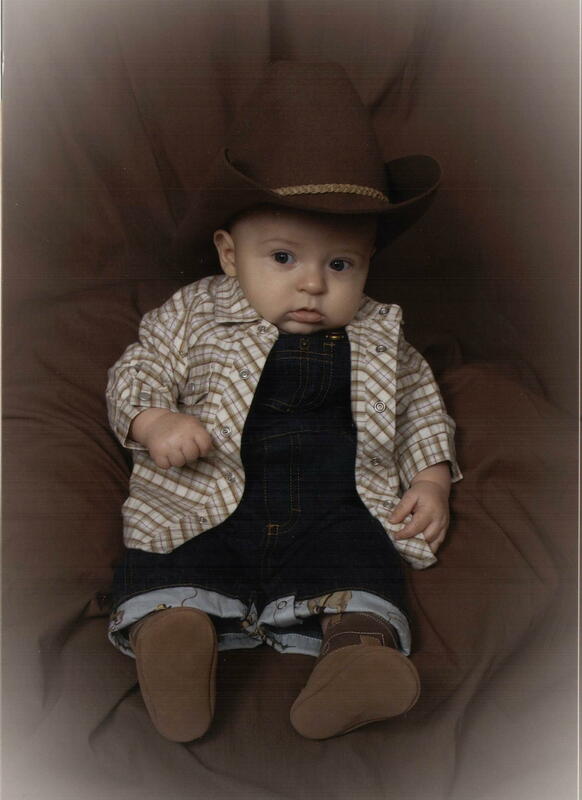 He also had on a little cowboy hat including 10 gallon hat and boots.........man he looks cute!!! This week he has started the "arching of his back" thing when he gets angry. I hope he grows out of that phase quickly, it's quite irritating at times. I really have to go, I promise to write more later........I just got home from work and I'm beat!!! I'll update later today or tomorrow! Today is Grandma & Grandpa Jim & Judy's 35th wedding anniversary! Congratulations! We went down to Preston and met them and Brad & Jen, Chad & Spud at the Branding Iron for supper on Saturday night. Hayden wore his cowboy outfit and his wore his boots, we decided to keep the hat at home though. I thought it would distract everyone in the restaurant so much because he's so cute in it! Also, other big news, just yesterday Hayden had a new cousin born. Cade Matthew Olson was born to Karla & Matt Olson (Ole......he was an usher in our wedding) on Sunday December 5th aroung 8:30pm. He was 7lbs 10 oz and 19 inches long. Delivery went great for everyone. We can't wait to meet him. 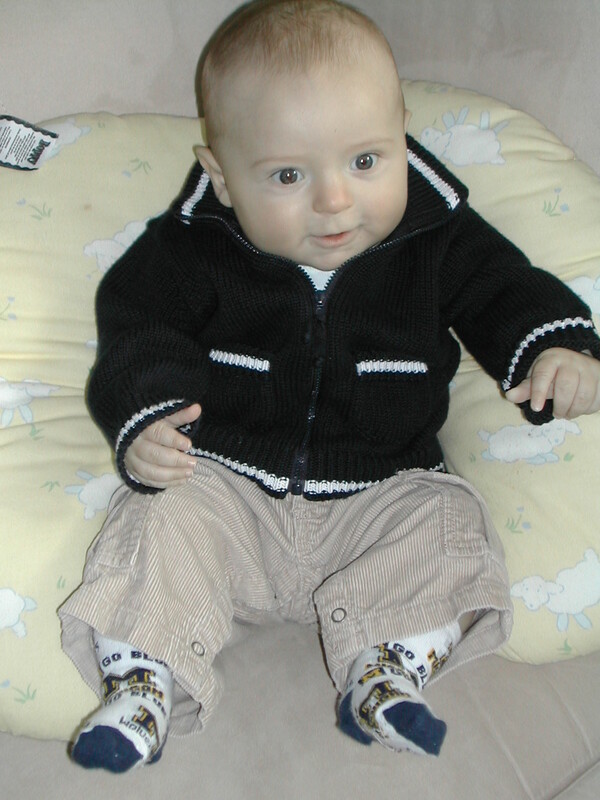 We're also waiting patiently for soon-to-be cousins, Brie & Matt's little guy, Kauri Matthew Dobbs, to be born. Ladies, I know how that waiting goes, it's the pits.........you're just so excited to meet the kid! They are truly the best thing that could ever happen, I'm so excited for all of you! Hayden has also had his first cold this week. He maybe had one cranky day, but otherwise he's been great. He HATES getting his nose suctioned out, but I definitely don't blame him. I think the relief he likes is by hanging his head upside down, it must feel good on his sinuses........he could hang with his head down forever. 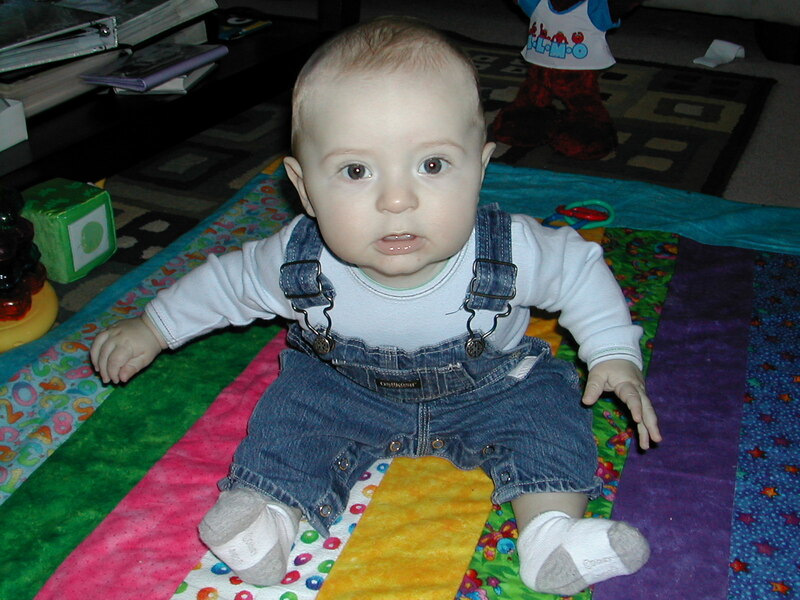 Hayden has his 4 month immunizations next Monday. The last set of shots went ok, I hope it goes ok again. I shed a few tears with Hayden, so hopefully we'll both be a little tougher this time. I got some really great pictures of the wedding from my Brad & Jen, I'm going to try and post a link to a place that you can view them. I'll post the website address on the wedding page hopefully later today and you can view some of them, until I get them posted on our site that is. The site is called snapfish.com, if you have a digital camera, this is seriously the best site! You just upload your pictures to their website and they'll develop them for you, it might be about 19 cents a picture. I've sent film into them (free postage), they'll post the pictures on your account and you can view them online before they're even sent back to you. You can do photocards.........it's seriously awesome! ANd not expensive at all! So that's my 'shout out' for a great website! Enough of that, must run Hayden is getting sick of it in the computer room and he keeps trying to eat my hand.....makes it hard to type! It was a big week for Hayden, the boy finally rolled over!!!! It was while I was making my weekly update on the website that he did it! He was playing in his play gym upstairs, while I was on the computer and I should have known something was up because he wasn't jabbering or yelling like he usually does...and as I walk up the stairs, I see him on his belly looking at himself in the play gym! I MISSED IT! 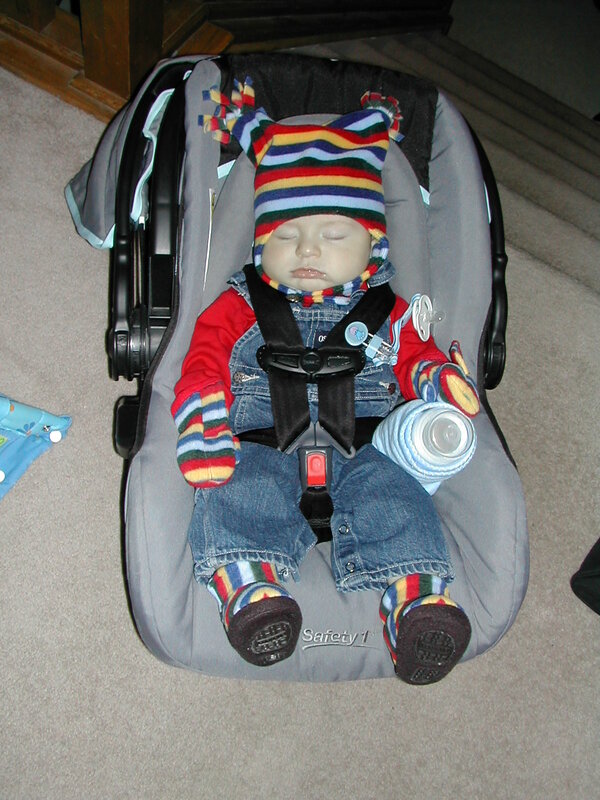 So, we have to keep a much closer eye on him now, he's going to be mobile before too long. Then on Tuesday, Hayden got to meet all my nursing students. We had a little potluck out at school before they did a presentation and I decided to bring a 'special visitor' and show him off to everyone. 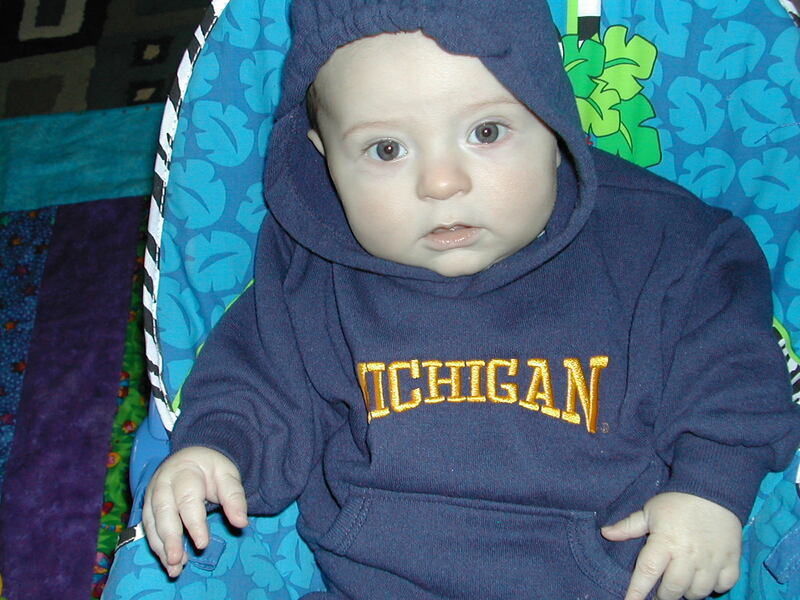 So, he got to go to college at 4 months of age! :-)~ I enjoyed being able to finally show of the real deal to my students, they hear so much about him. Wednesday we got his pictures from Target and finally got our Xmas and Thank you cards mailed out. I am going to put our Xmas card up on the website, so if by some chance you didn't get one, you can see his picture up here. They turned out so cute! And, I've already had to go and reorder some more wallets. The cowboy pictures are a hit! I'll scan and post one of those as well if you haven't already checked out the target website! 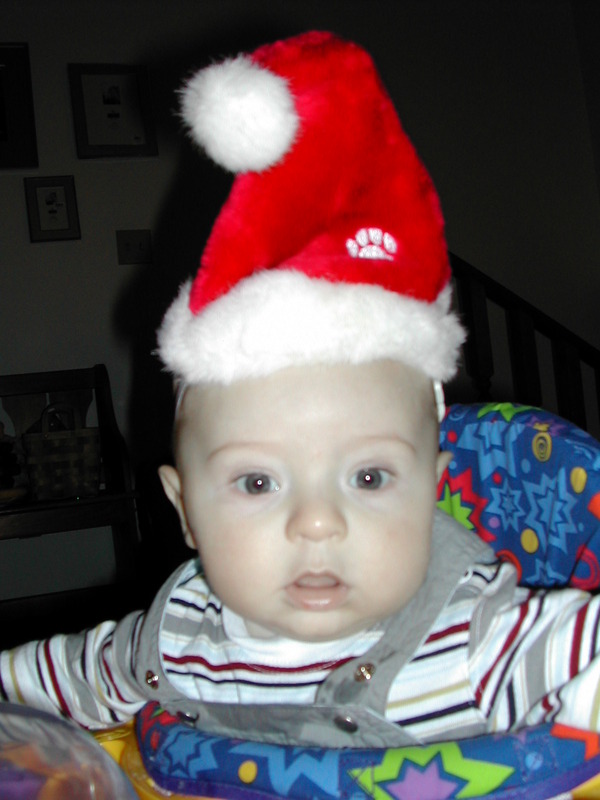 I also took some really great pictures at home of him in his two "Baby's First Christmas" outfits and in his santa hat. My digital camera died, so I had to use my film camera, but I'll be getting a preview of those prints very soon, so I'll be sure to post all those pictures on our "Christmas Page" which I'll get the pictures up very soon, (some pictures already posted)! All these little projects and things to do with the website. I need about 3 days, just to get everything up to date!!! Friday night was Aunt Ashley's first performance for the Byron danceline, The Sugar Bears. Ashley is the team's captain and we were pretty excited about going to see her dance, especially since I was on danceline when I was in high school. We were Ashley's fan club and I even made a shirt for Hayden to wear to show his support. See picture below! :-) It was a hit, we might have to get one officially made for him to wear to the games/performances. Ashley did AWESOME! and the routine was really fun, so I was SO glad we got to go. We even taped it so Dennis could watch it too. Hayden was very well behaved at the basketball game too! He enjoyed to noise of the crowd and watching everyone. It was so funny, a guy was eating a hotdog and nachos in front of us and Hayden wouldn't stop staring at him, every time he'd take a bite, Hayden was watching him like a hawk. Almost like he thought, "oooh, I'd love a bite of that hotdog!" or just the action of the guy bringing his hand to his mouth, Hayden could relate to! What a goof! I honestly think any day now, a tooth has to pop through.........he's been drooling even more, he's even learned to blow bubbles! His cheeks are getting rosy and he's getting almost inconsolable at times. The runny nose has stopped, but he's still having a daily blowout of the diaper.........so we'll see....but I think that first tooth will be soon. 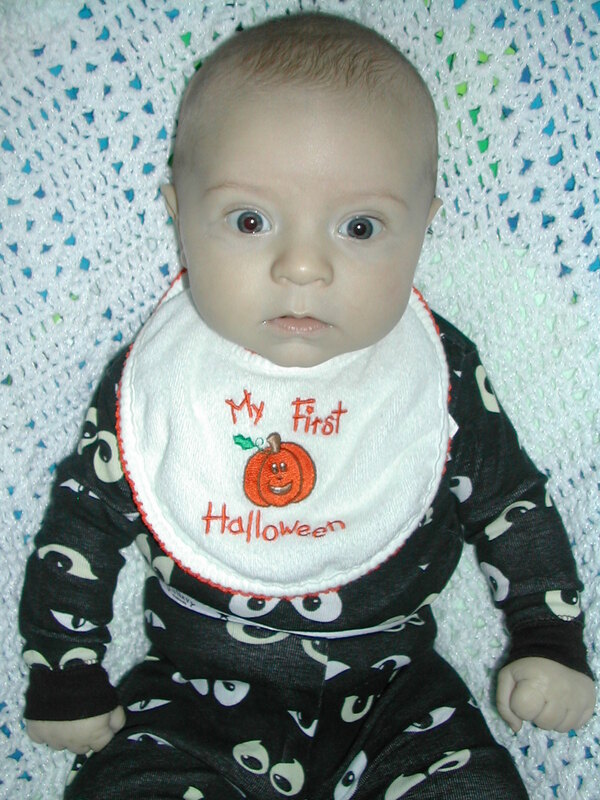 Hayden has his 4 month check up today, along with a few more vaccinations. He's a tough kiddo and will do fine. 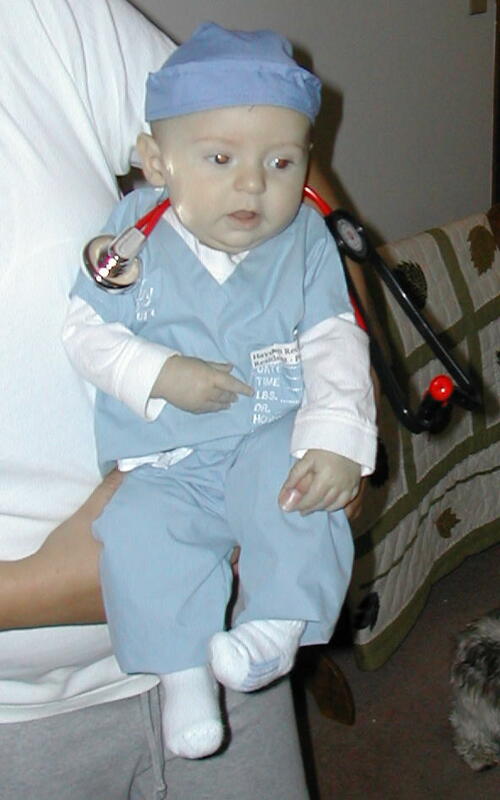 I can't wait to hear what percentile he is for weight, length, etc. He just seems SO big. He's acting like such a big boy too! Well, I think that's the big news for the week! Keep checking back throughout the week, hopefully I"ll get more accomplished, I'm on a break from teaching for a few weeks! But, I have to get the rest of my grading done in the next few days...........so I'll be very busy with that! 11 days to Xmas.......YIKES! He reminds me of one of the "Who"s in The Grinch that Stole Christmas...........it's Hayden Who! So, the scoop from the doctor's appointment...........Hayden weighed over 17lbs!, which puts him in the 84th%ile for his weight and was 26.5 inches long, 92nd%ile for length. 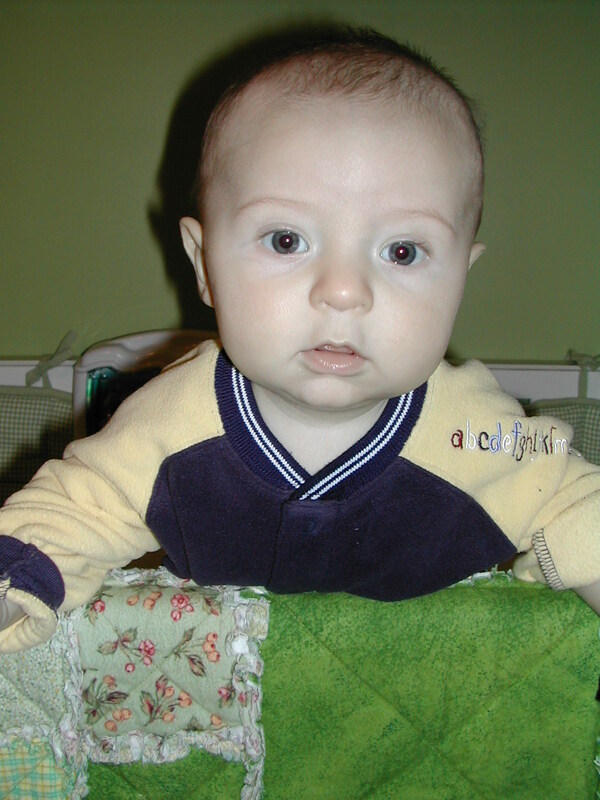 His head is still average, which is great to hear, a lot of times, babies this age look like they are all 'head' :-) The pediatrician also said that developmentally she would consider him more at the 6month level and was so impressed with his activity. She liked to see him standing and how strong and coordinated he was. He had another 4!!! shots and neither one of us cried too awfully bad, Hayden a little bit more than me. The shots bothered him for most of the week though........it has been pretty grumpy.....and with reason. I think his teeth have been up to no good too. He just hasn't been himself. He's usually pretty chatty and makes lots of squeals, but he's been kind of dopey looking and quiet. Well, I cannot believe it, but Xmas is almost here. I had to keep telling myself that it's just this weekend! It doesn't even seem like it should be this soon. I have so much to do yet too! That's the scary part. Thank god for online shopping and quick shipping! I'm afriad with how much that can be done on the computer, I could end up locked up in the house for much of the winter! 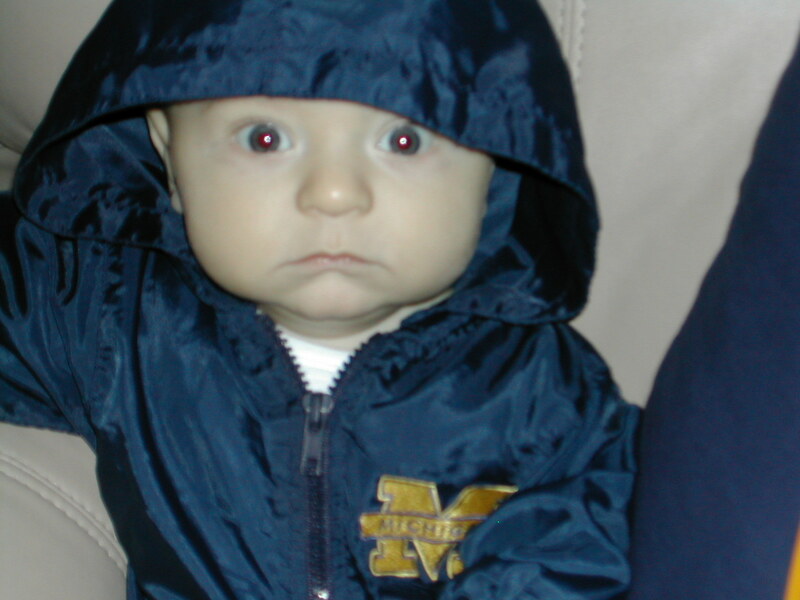 Hayden HATES getting his jacket on and then put in the carseat. He gets real warm and doesn't like the layers. He's getting a little better with the hats and mittens, although he tries to rip the mittens off because he can't chew on his hands with them on. Well, I can't seem to think of anything else to update you on.........we'll have lots of things to share next week after Xmas. I'm sure Hayden is going to make out like a bandit!!! 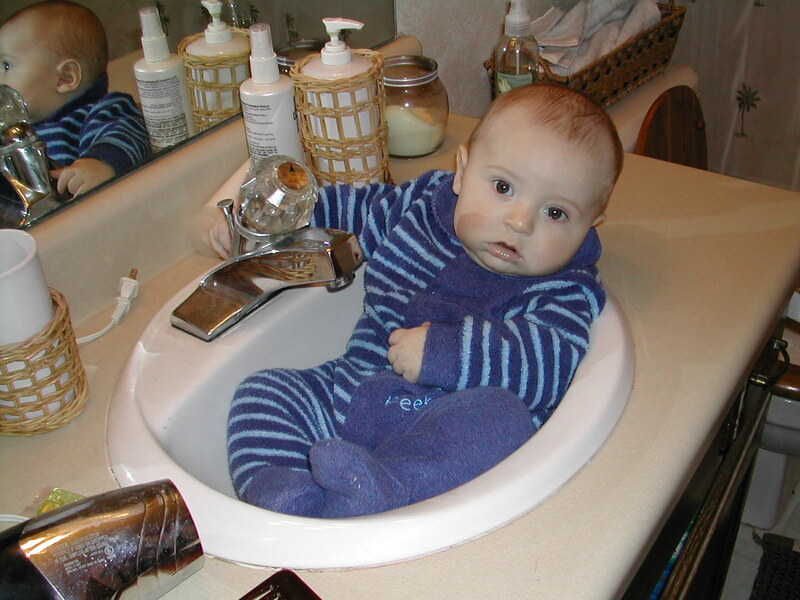 Hayden relaxing in his 'hot tub'! Put your mouse over this picture to see a close up of the mess he made while eating cereal! Christmas pictures are up already, check them out! I hope everyone had a great Xmas, we had a great holiday! Hayden of course mad out like a bandit! He got so many fun new toys and is just having a blast. Some of his new loves are the telephone and tractors. Anytime I'm on the telephone he is grabbing it at it and wants to play with it. Although, I think I may have created that monster, I always have him talk to my mom whenever she calls, so he'll hear her voice and then smile and look at the phone. So, Uncle Chad gave him a toy phone for Xmas. Uncle Chad also gave him a new International tractor, just like the ones Grandpa Reckward fixes. 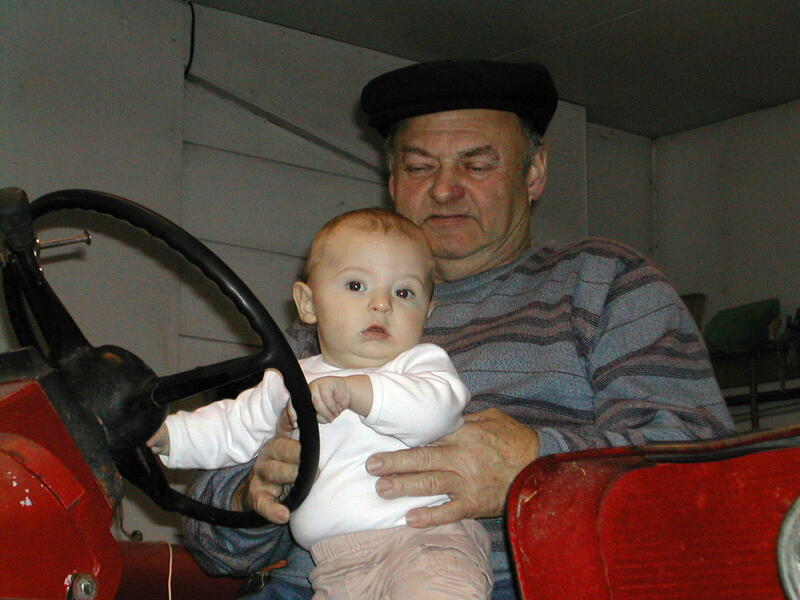 It was so cute, Grandpa had Hayden out in the garage on Christmas day, showing him the tractor and his tools. Hayden grabbed right for the steering wheel and the shift lever, like he knew exactly what he was doing. It must be in his blood. His toes are his true, true love though.....they're his favorite toy as you can see in the picture below. The kid is obsessed! He'll pull his socks off just to get to them. He did that for the first time right before we went and saw Santa Claus at the Mall. Hayden is getting bigger and more and more amazing everyday. 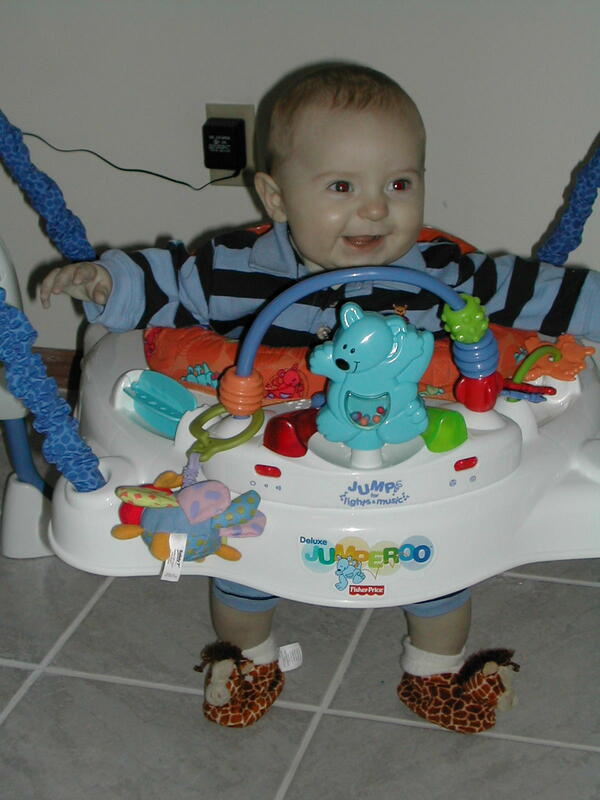 His new funny move is in his new "Jumperoo" that Daddy bought him, especially because he does this while wearing his new giraffe slippers he got from Jessica. He looks like he's running in place.....he seriously lifts his feet up and runs.......it's absolutely hysterical because he just has the best time! I'll have to get a picture of it and post it next week. That kid is going to be walking just as soon as he gets his balance! 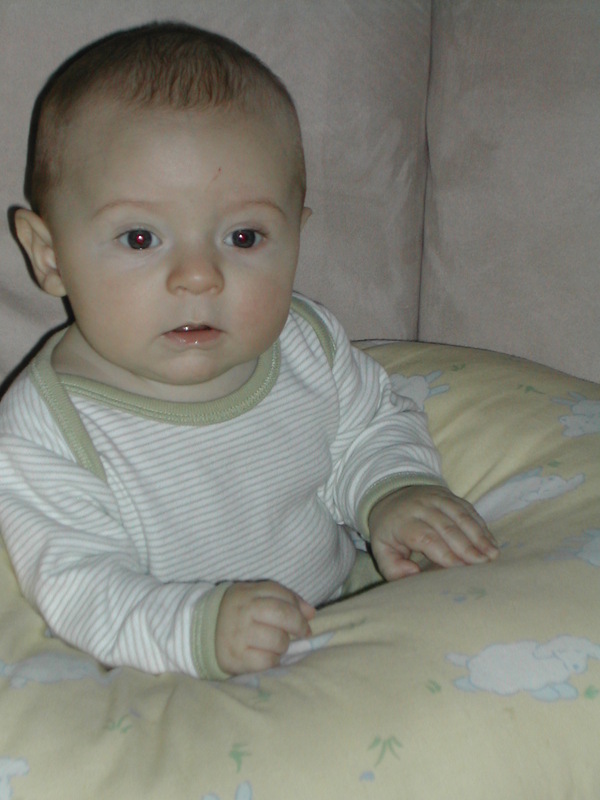 He is getting a bit more stable sitting up, he can stay upright, but just leans forward onto his legs, it looks so uncomfortable! Needless to say, we've been having a blast with Hayden. He is the little boy of our dreams! WEEK 21: January 3rd HAPPY NEW YEAR! I hope everyone brought the new year in safely! I was at work when the new year came, so Dennis gave Hayden a New Year's kiss for me. The boys spent the night hanging out with each other and Dennis was all pumped up and feeling good for the Rose Bowl game on Saturday. Unfortunately, the Wolverines just barely lost the game...........but not without the support of the Reckward boys! This has been a nice easy going week, the holidays are over and no school! I'm really liking this free time! Hayden has been a saint, he has been sleeping through the night, approx 8-10 hours! NICE! So, I've had a few really good nights of sleep! He's still enjoying 'quiet time' in his crib, where he plays by himself and listens to music in his room. Sometimes he'll fall asleep other times he just plays and plays. He really loves music and will start swaying side to side or stomp his feet when he hears it! I can't wait until he'll start wiggling his big diaper booty! :-) He's so pleasant most the time and really starting to form routines and likes/dislikes. He's getting more and more balanced on his feet. 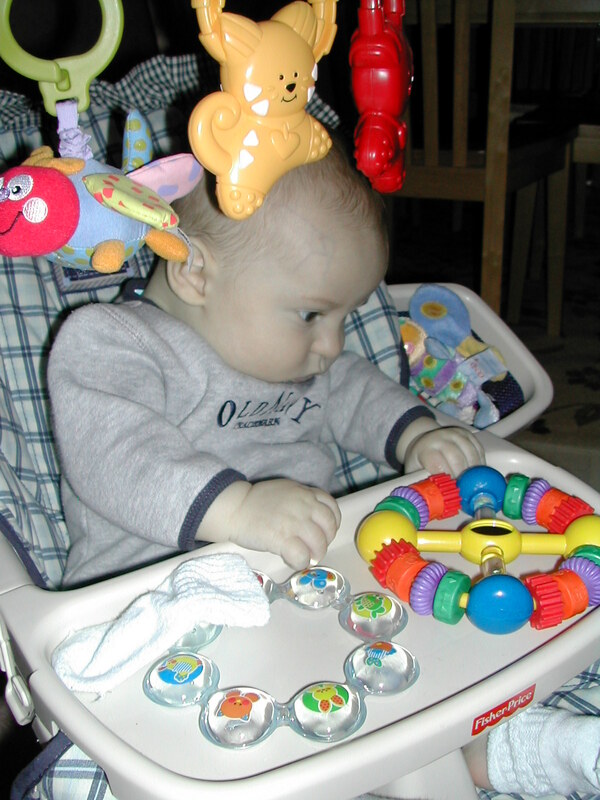 The jumperoo (below) has really helped, he needs to support himself quite a bit with that toy and he does a great job. He also rolled from his belly to his back for me while playing in the gym. Dennis has found him in his crib that way but I hadn't witnessed it until now. It won't be long and we'll have to start 'Hayden-proofing' the house as he starts getting more mobile. He still grabs for absolutely everything in your hands and has to be a part of everything, especially when I'm in the kitchen.. He is starting to realize when I'm out of sight and sometimes starts fussing if he can't see me, even when he is just playing in his Hop 'n' Pop.. But I can't complain because when I 'reappear' he has a great big smile for me, that's always a hearwarming greeting. He's growing so fast and getting to be just a little man, so I wanted to show you a picture of him in his cute little mesh shorts, just like his dad's! He doesn't look too chunky, but believe me, there are rolls upon rolls on those thighs of his, the shorts do a good job of covering them! That's about all for now, another fun week ahead of us! WIll write more on Monday! WEEK 22: January 10th FIVE MONTHS!!! You are NEVER going to believe this when I say this, but I have NO NEW PICTURES from this past week! What kind of mother am I? I think it's been because Hayden has been so busy doing "new" things, that I hadn't had time to grab the camera. I feel like I'm slipping! :-)~ Where should we begin? Hayden went to his first movie on Tuesday with Mom and Dad.........on the first and third Tuesday of the month, Chateau Theatres has what's called, "Reel Babies" where you can take your newborn to a newly released movie, check out their website for more information, it was a lot of fun. I'm hoping to do it again soon. Hayden did really good but insisted on standing up on the stairs and screaming at the theatre lights on the edge of the steps. It was probably the most exciting thing for him there. We finally got to see Meet the Fockers and didn't have to wait until "Date Night" to go to it. He also went to his first Fish Fry at Brothers on Friday night. We met my mom and dad there and we ran into a few people we know, so it was neat to show him off. Hayden also had to show off by grabbing my mom's drink and spilling it all over.........and then try to grab my beer every time I took a drink! That's the new thing, no matter what you have, he wants it too......the remote, the phone, whatever you're drinking or eating. Hayden is also starting to make more distinct sounds..............he'll tuck his bottom lip under and then say 'mmmmmmmmm', ALOT! I keep trying to get him to say 'ma, ma', since he's already saying the "m" part! :-) He's also screaming with delight.......you'll tickle him or rub your head in his belly and he just screams/laughs! It's the best sound, you can't help but laugh. He's rolling like mad, he'll be in one spot and with just looking away for a second, he'll be several feet away in seconds or have completely turned a 180 from whatever way he was facing......and trying to pull himself up on his knees! 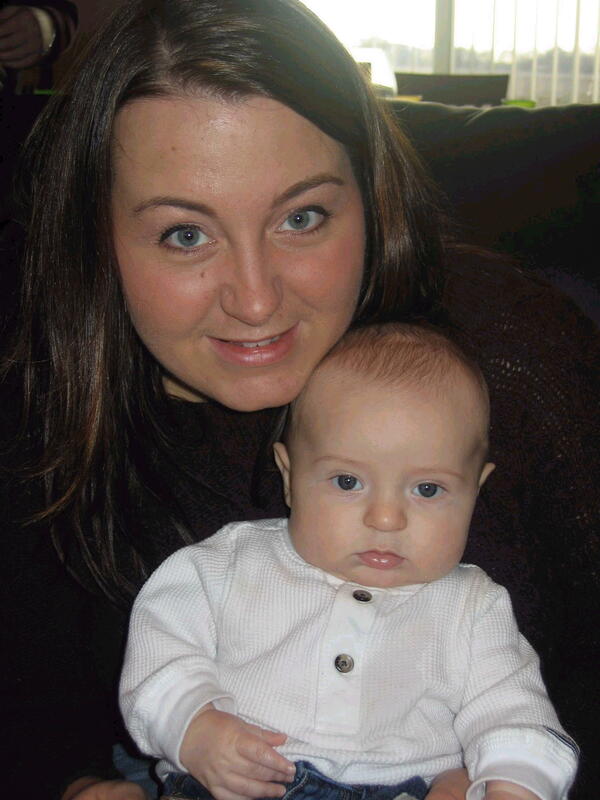 For the upcoming week, we're going to enter Hayden in the Post Bulletin's Cutest Baby Contest, now it's just a matter of finding the right picture. I'll be sure to post the voting information, so that way everybody knows what number to call in order to vote! I believe the actual paper with all the contestants comes out the end of February, so you'll definitely be hearing from me then! If you have any ideas for a certain picture to submit, let me know. That's about all for now.............thanks for checking in on us! I have pictures this week!!! I had to get some "action shots" of Hayden doing some of his fun new things. The first one is of him sitting by himself. He's able to balance himself sitting pretty good, but still prefers to stand. 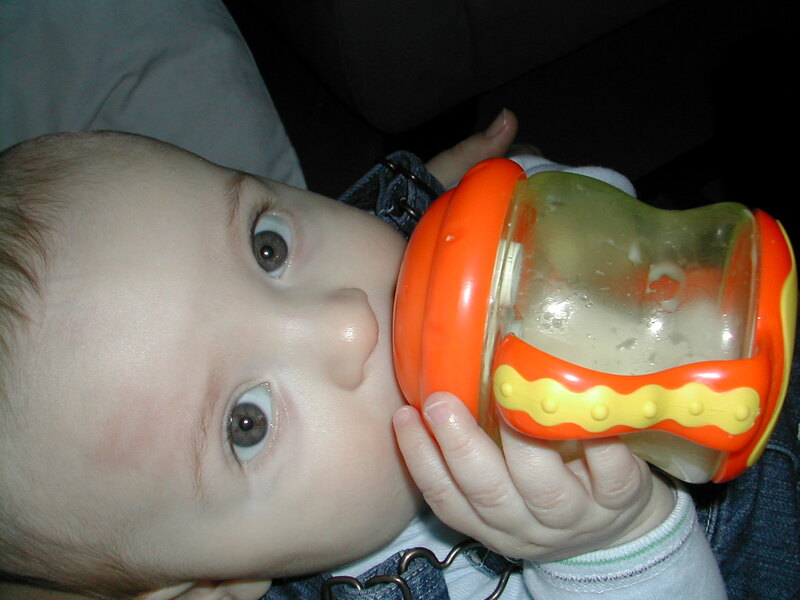 He's holding his own bottle now, and insists on putting his mouth on anything we put to ours (drinks, food, utensils, etc). He really likes my big red mug for water and grabs it and puts his mouth on it...........so I thought, we'll see what he does with the sippy cup Santa Claus brought him. He loves to chew on it and will tip it back, so I put a little milk in it and the kid drank right out of it!! Genius! :-)~ JK! 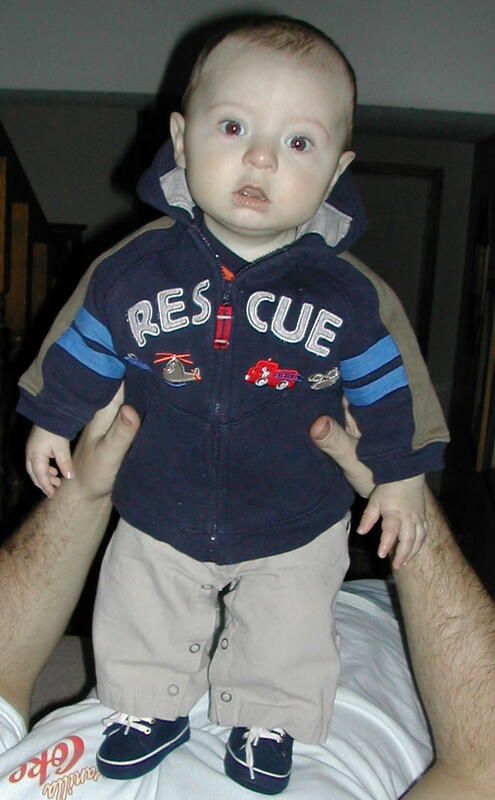 In the second picture, Hayden is showing off his first official 'bump to the head". He was playing on the floor and hit it on the bottom shelf of the coffee table and he let out one one good cry. It looked and sounded like it hurt. It's official, he's a boy, he'll probably start showing off a lot of those in his pictures from now on, unfortunately. And in the last picture, this is nothing new, but he's coming up with more and more things to put in his mouth. 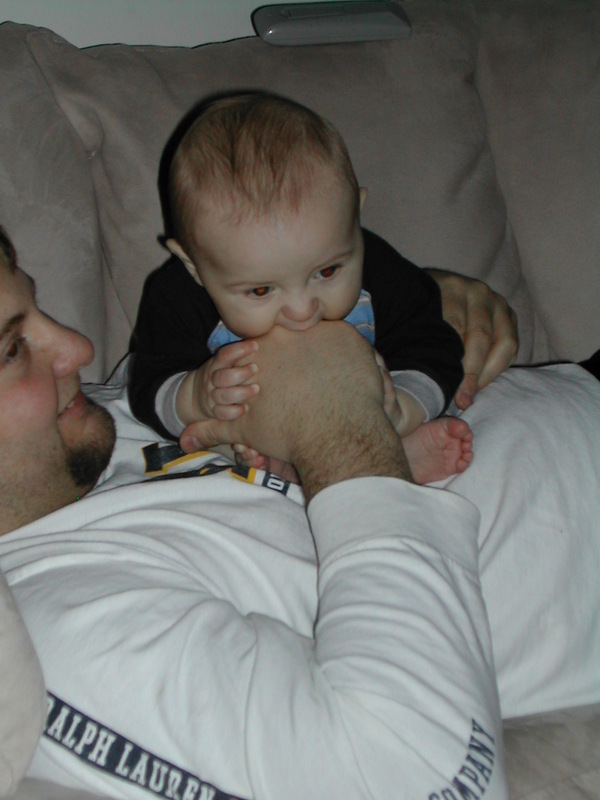 I titled this picture, "Eating Daddy! "...........he's also started sucking/chewing on my face. I want to think he's trying to give me a kiss. He's done it a few times after waking up in the morning he'll give me a big huge smile, grab my face and give me a big wide kiss Is that love or what? Who wouldn't want to come home to that? Hayden has also discovered that there is a world behind him...........and is now constantly looking behind him whether there's nothing there or not. 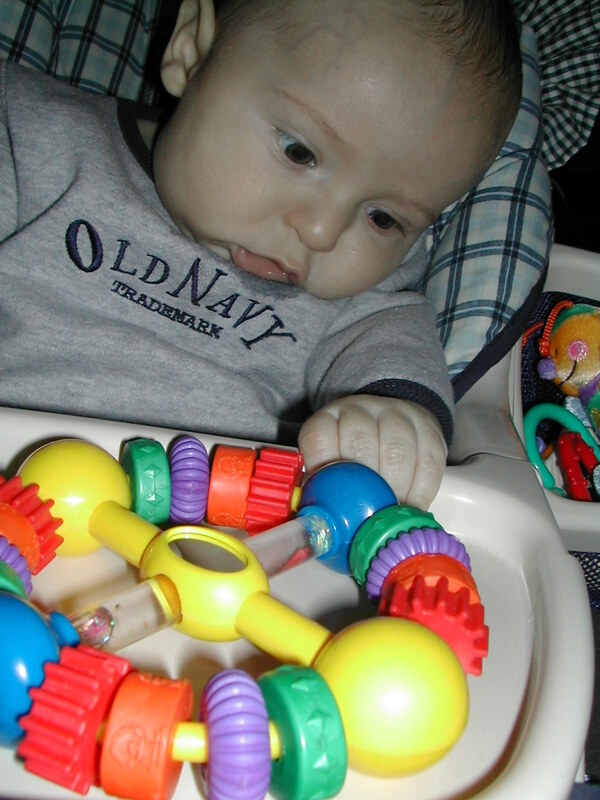 I think the exersaucer at my mom and dad's has gotten him used to spinning around and now realizes there's more to life than what's straight ahead. He is just intrigued with everything and is loving life. He's been so pleasant and such a joy. The other morning he got up a little early and we put him in bed with us and he laid in bed and talked for about 10 minutes solid. It was as if he was telling us a story. I just listen to all the different sounds he makes and wonder if he knows what he is saying. 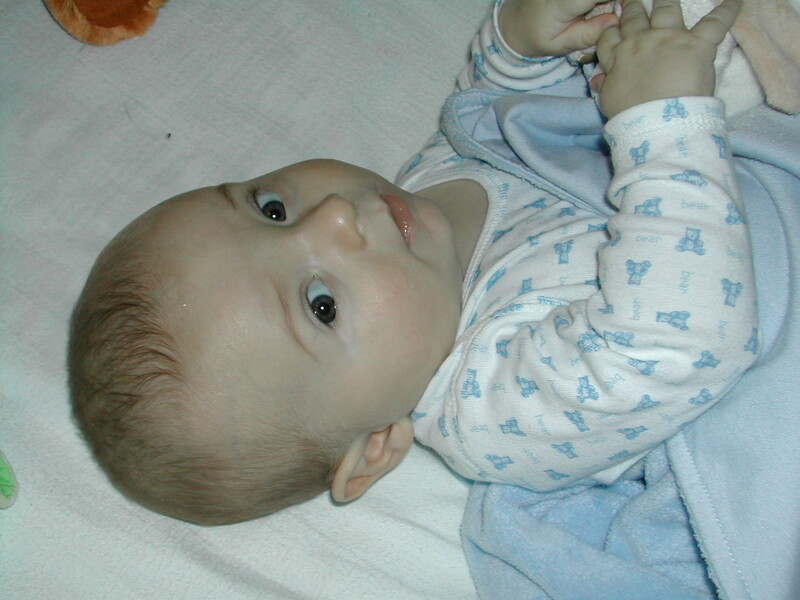 I am going to buy the "Baby Sign" books and video very soon and start working with him on that. It's never too early to have them try to communicate with you. That's about all I can think of right now, I worked last night and the brain is a little tired this morning. So I may update later if I think of more stuff! PS, I don't know if you noticed, but Hayden is getting a lot more hair!! It's thicker and actually it's getting kind of light on top!